Yoshida M, Nakamichi T, Mori T, Kenta Ito K, Shimokawa H, Ito S. Low-energy extracorporeal shock wave ameliorates ischemic acute kidney injury in rats. Clin Exp Nephrol. (2019) https://doi.org/10.1007/s10157-019-01689-7. Ikeda S, Mizushima W, Sciarretta S, Abdellatif M, Zhai P, Mukai R, Fefelova N, Oka S, Nakamura M, Del Re DP, Farrance I, Park JY, Tian B, Xie LH, Kumar M, Hsu CP, Sadayappan S, Shimokawa H, Lim DS, Sadoshima J. Hippo deficiency leads to cardiac dysfunction accompanied by cardiomyocyte dedifferentiation during pressure overload. Circ Res. 124(2):292-305,2019. 林　あかね、荒川元孝、山本裕朗、諸沢　薦、下川宏明、金井　浩：ブタ心臓壁における収縮応答の伝播速度の心筋虚血による低下の超音波計測. Jpn J Med Ultrasonics. 45:595-603,2018. Ito K, Shindo T, Shimokawa H. Low-energy extracorporeal shock wave therapy. In: Higashi Y, Murohara T (eds.). Therapeutic Angiogenesis. pp. 177-190. Springer Nature, Singapore, 2017. Beltrame JF, Crea F, Kaski JC, Ogawa H, Ong P, Sechtem U, Shimokawa H, Merz CNB, the COVADIS Group. The who, what, why, when, how and where of vasospastic angina. Circ J. 80:289-298,2016. Hatanaka K, Ito K, Shindo T, Kagaya Y, Ogata T, Eguchi K, Kurosawa R, Shimokawa H. Molecular mechanisms of the angiogenic effects of low-energy shock wave therapy: Roles of mechanotransduction. Am J Physiol. 311:C378-385,2016. Komatsu M, Takahashi J, Fukuda K, Takagi Y, Shiroto T, Nakano M, Kondo M, Tsuburaya R, Hao K, Nishimiya K, Nihei T, Matsumoto Y, Ito K, Sakata Y, Miyata S, Shimokawa H. Usefulness of Testing for Coronary Artery Spasm and Programmed Ventricular Stimulation in Survivors of Out-of-Hospital Cardiac Arrest. Circ Arrhythm Electrophysiol. 9:doi:10.1161/CIRCEP.115.003798,2016. Minami T, Satoh K, Nogi M, Kudo S, Miyata S, Tanaka S, Shimokawa H. Statins up-regulate SmgGDS through ß1-integrin/Akt1 pathway in endothelial cells. Cardiovasc Res. 109:151-161,2016. Nishimiya K, Matsumoto Y, Uzuka H, Ohyama K, Hao K, Tsuburaya R, Shiroto T, Takahashi J, Ito K, Shimokawa H. Focal vasa vasorum formation in patients with focal coronary vasospasm -An optical frequency domain imaging study- Circ J. 80:2252-2254,2016. Nishimiya K, Matsumoto Y, Takahashi J, Uzuka H, Wang H, Tsuburaya R, Hao K, Ohyama K, Odaka Y, Miyata S, Ito K, Shimokawa H. Enhanced adventitial vasa vasorum formation in patients with vasospastic angina -Assessment with optical frequency domain imaging- J Am Coll Cardiol. 67:598-600,2016. Ohyama K, Matsumoto Y, Nishimiya K, Hao K, Tsuburaya R, Ota H, Amamizu H, Uzuka H, Takahashi J, Ito K, Shimokawa H. Increased coronary perivascular adipose tissue volume in patients with vasospastic angina. Circ J. 80:1653-1656,2016. Saito S, Ishii T, Kamogawa Y, Watanabe R, Shirai T, Fujita Y, Shirota Y, Fujii H, Ito K, Shimokawa H, Yamaguchi T, Kawaguchi Y, Harigae H. Extracorporeal shock wave therapy for digital ulcers of systemic sclerosis: A phase 2 pilot study. Tohoku J Exp Med. 238:39-47,2016. Shimokawa H, Godo S. Diverse functions of endothelial NO synthases system: NO and EDH. J Cardiovasc Pharmacol. 67:361-366，2016. Yahata K, Kanno H, Ozawa H, Yamaya S, Tateda S, Ito K, Shimokawa H, Itoi E. Low-energy extracorporeal shock wave therapy promotes VEGF expression and angiogenesis and improves locomotor and sensory functions after spinal cord injury. J Neurosurg Spine. 1:1-11,2016. Zheng Y, Wei D, Zhu X, Chen W, Fukuda K, Shimokawa H. Transmural, interventricular, apicobasal and anteroposterior action potential duration gradients are all essential to the genesis of the concordant and realistic T wave: A whole-heart model study. J Electrocardiol. 2016;49:569-78,2016. Hasebe Y, Yamamoto H, Fukuda K, Nishimiya K, Hanawa K, Shindo T, Kondo M, Nakano M, Wakayama Y, Takayama K, Shimokawa H. Development of a novel shock wave catheter ablation system -The first feasibility study in pigs- PLoS One. 2015;10(1):e0116017. Nishimiya K, Matsumoto Y, Shindo T, Hanawa K, Hasebe Y, Tsuburaya R, Shiroto T, Takahashi J, Ito K, Ishibashi-Ueda H, Yasuda S, Shimokawa H. Association of adventitial vasa vasorum and inflammation with coronary hyperconstriction after drug-eluting stent implantation in pigs in vivo. Circ J. 79:1787-1798,2015. Nishimiya K, Matsumoto Y, Uzuka H, Oyama K, Tanaka A, Taruya A, Ogata T, Hirano M, Shindo T, Hanawa K, Hasebe Y, Hao K, Tsuburaya R, Takahashi J, Miyata S, Ito K, Akasaka T, Shimokawa H. Accuracy of optical frequency domain imaging for evaluation of coronary adventitial vasa vasorum formation after stent implantation in pigs and humans -A validation study- Circ J. 79:1323-1331,2015. Noda K, Godo S, Saito H, Tsutsui M, Shimokawa H. Opposing roles of nitric oxide and Rho-kinase in lipid metabolism in mice.Tohoku J Exp Med. 235:171-183,2015. Suzuki H, Sumiyoshi A, Matsumoto Y, Duffy B, Yoshikawa T, Lythgoe M, Yanai K, Taki Y, Kawashima R, Shimokawa H. Structural abnormality of the hippocampus associated with depressive symptoms in heart failure rats. NeuroImage. 105:84-92,2015. Tsutsui M, Tanimoto A, Tamura M, Mukae H, Yanagihara N, Shimokawa H, Otsuji Y. Significance of nitric oxide synthases: Lessons from triple nitric oxide synthases null mice. J Pharmacol Sci. 127:42-52,2015. Zheng Y, Wei D, Zhu X, Chen W, Fukuda K, Shimokawa H. Ventricular fibrillation mechanisms and cardiac restitutions: An investigation by simulation study on whole-heart model. Comput Biol Med. 63:261-268,2015. Abe Y, Ito K, Hao K, Shindo T, Ogata T, Kagaya Y, Kurosawa R, Nishimiya K, Satoh K, Miyata S, Kawakami K, Shimokawa H. Extracorporeal low-energy shock-wave therapy exerts anti-inflammatory effects in a rat model of acute myocardial infarction. Circ J. 78:2915-2925,2014. Enkhjargal B, Godo S, Sawada A, Suvd N, Saito H, Noda K, Satoh K, Shimokawa H. Endothelial AMPK regulates blood pressure and coronary flow responses through hyperpolarization mechanism in mice. Arterioscler Thromb Vasc Biol. 34:1505-1513,2014. Ikeda S, Satoh K, Kikuchi N, Miyata S, Suzuki K, Omura J, Shimizu T, Kobayashi K, Kobayashi K, Fukumoto Y, Sakata Y, Shimokawa H. Crucial role of Rho-kinase in pressure-overload-induced right ventricular hypertrophy and dysfunction in mice. Arterioscler Thromb Vasc Biol. 34:1260-1271,2014. Nihei T, Takahashi J, Tsuburaya R, Ito Y, Shiroto T, Hao K, Takagi Y, Matsumoto Y, Nakayama M, Miyata S, Sakata Y, Ito K, Shimokawa H. Circadian variation of rho-kinase activity in circulating leukocytes of patients with vasospastic angina. Circ J. 78:1183-1190,2014. Noda K, Nakajima S, Godo S, Saito H, Ikeda S, Shimizu T, Enkhjargal B, Fukumoto Y, Tsukita S, Yamada T, Katagiri H, Shimokawa H. Rho-kinase inhibition ameliorates metabolic disorders through activation of AMPK pathway in mice. PLoS One. 2014;9(11):e110446. Noguchi S, Yatera K, Wang KY, Oda K, Akata K, Yamasaki K, Kawanami T, Ishimoto H, Toyohira Y, Shimokawa H, Yanagihara N, Tsutsui M, Mukae H. Nitric oxide exerts protective effects against bleomycin-induced pulmonary fibrosis in mice. Respir Res. 15:92.doi:10.1186/s12931-014-0092-3. Yamaya S, Ozawa H, Kanno H, Kishimoto KN, Sekiguchi A, Tateda S, Yahata K, Ito K, Shimokawa H, Itoi E. Low-energy extracorporeal shock wave therapy promotes VEGF expression and neuroprotection and improves locomotor recovery after spinal cord injury. J Neurosurg. 121:1514-1525,2014. Eba S, Hoshikawa Y, Moriguchi T, Mitsuishi Y, Satoh H, Ishida K, Watanabe T, Shimizu T, Shimokawa H, Okada Y, Yamamoto M, Kondo T. The nuclear factor erythroid 2-related factor 2 activator oltipraz attenuates chronic hypoxia-induced cardiopulmonary alterations in mice. Am J Respir Cell Mol Biol. 49:324-333,2013. Shimizu T, Fukumoto Y, Tanaka S, Satoh K, Ikeda S, Shimokawa H. Crucial role of ROCK2 in vascular smooth muscle cells for hypoxia-induced pulmonary hypertension in mice. Arterioscler Thromb Vasc Biol. 33:2780-2791,2013. Suzuki H, Sumiyoshi A, Kawashima R, Shimokawa H. Diffrenet brain activation under left and right ventricular stimulation: An fMRI study in anesthetized rats. PLoS One 2013;8(2):e56990. Aizawa K, Yasuda S, Takahashi J, Takii T, Kikuchi Y, Tsuburaya R, Ito Y, Ito K, Nakayama M, Takeda M, Shimokawa H. Involvement of Rho-kinase activation in the pathogenesis of coronary hyperconstricting responses induced by drug-eluting stents in patients with coronary artery disease. Circ J. 76:2552-2560,2012. Hayashi D, Kawakami K, Ito K, Ishii K, Tanno H, Imai Y, Kanno E, Maruyama R, Shimokawa H, Tachi M. Low-energy extracorporeal shock wave therapy enhances skin wound healing in diabetic mice: a critical role of endothelial nitric oxide synthase. Wound Repair Regen. 20:887-895,2012. Noda K, Hosoya M, Nakajima S, Ohashi J, Fukumoto Y, Shimokawa H. Anti-atherogenic effects of the combination therapy with olmesartan and azelnidipine in diabetic apolipoprotein e-deficient mice. Tohoku J Exp Med. 228:305-315,2012. Tsuburaya R, Yasuda S, Shiroto T, Ito Y, Gao JY, Aizawa K, Kikuchi Y, Ito K, Takahashi J, Ishibashi-Ueda H, Shimokawa H. Long-term treatment with nifedipine suppresses coronary hyperconstricting responses and inflammatory changes induced by paclitaxel-eluting stent in pigs in vivo: possible involvement of Rho-kinase pathway. Eur Heart J. 33:791-799,2012. Gao JY, Yasuda S, Tsuburaya R, Ito Y, Shiroto T, Hao K, Aizawa K, Kikuchi Y, Ito K, Shimokawa H. Long-term treatment with eicosapentaenoic acid ameliorates myocardial ischemia-reperfusion injury in pigs in vivo -Involvement of Rho-kinase pathway inhibition- Circ J. 75:1843-1851,2011. Ito K, Fukumoto Y, Shimokawa H. Extracorporeal shock wave therapy for ischemic cardiovascular disorders. Am J Cardiovasc Drugs. 11:295-302,2011. Kikuchi Y, Yasuda S, Aizawa K, Tsuburaya R, Ito Y, Takeda M, Nakayama M, Ito K, Takahashi J, Shimokawa H. Enhanced Rho-kinase activity in circulating neutrophils of patients with vasospastic angina: a possible biomarker for diagnosis and disease activity assessment. J Am Coll Cardiol. 58:1231-1237,2011. 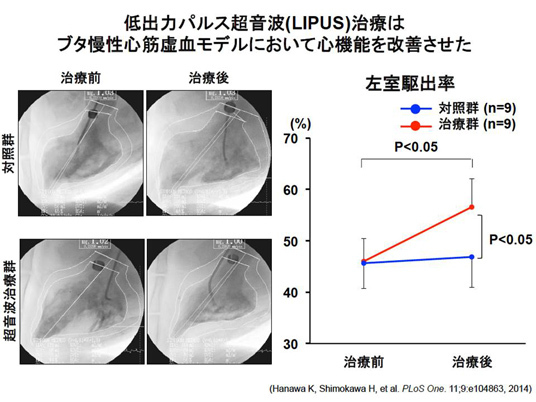 Serizawa F, Ito K, Matsubara M, Sato A, Shimokawa H, Satomi S. Extracorporeal Shock Wave Therapy Induces Therapeutic Lymphangiogenesis in a Rat Model of Secondary Lymphoedema. Eur J Vasc Endovasc Surg. 42:254-260,2011. Tsuburaya R, Yasuda S, Ito Y, Shiroto T, Gao JY, Ito K, Shimokawa H. Eicosapentaenoic acid reduces ischemic ventricular fibrillation via altering monophasic action potential in pigs. J Mol Cell Cardiol. 51:329-336,2011. Ito Y, Ito K, Shiroto T, Tsuburaya R, Gao JY, Takeda M, Fukumoto Y, Yasuda S, Shimokawa H. Cardiac shock wave therapy ameliorates left ventricular remodeling after myocardial ischemia-reperfusion injury in pigs in vivo. Coron Artery Dis. 21:304-311,2010. Ito K, Kagaya Y, Shimokawa H. Thyroid hormone and chronically unloaded hearts. Vascul Pharmacol. 52:138-141,2010. Takii T, Yasuda S, Takahashi J, Ito K, Shiba N, Shirato K, Shimokawa H; MIYAGI-AMI Study Investigators. Trends in acute myocardial infarction incidence and mortality over 30 years in Japan: report from the MIYAGI-AMI Registry Study. Circ J. 74:93-100,2010. 伊藤健太，下川宏明 : 体外衝撃波を用いた非侵襲性血管新生療法. 日本内科学会雑誌　99:2846-2852,2010. Ito K, Fukumoto Y, Shimokawa H. Extracorporeal shock wave therapy as a new and non-invasive angiogenic strategy. Tohoku J Exp Med. 219:1-9,2009. Shiroto T, Yasuda S, Tsuburaya R, Ito Y, Takahashi J, Ito K, Ishibashi-Ueda H, Shimokawa H. Role of Rho-kinase in the pathogenesis of coronary hyperconstricting responses induced by drug-eluting stents in pigs in vivo. J Am Coll Cardiol. 54:2321-2329,2009. Takagi Y, Yasuda S, Takahashi J, Takeda M, Nakayama M, Ito K, Hirose M, Wakayama Y, Fukuda K, Shimokawa H. Importance of dual induction tests for coronary vasospasm and ventricular fibrillation in patients surviving out-of-hospital cardiac arrest. Circ J. 273:767-769,2009. Tada T, Nawata J, Wang H, Onoue N, Zhulanqiqige D, Ito K, Sugimura K, Fukumoto Y, Shimokawa H. Enhanced pulsatile pressure accelerates vascular smooth muscle migration: implications for atherogenesis of hypertension. Cardiovasc Res. 17:449-455,2008. Ulrich M, Petre A, Youhnovski N, Promm F, Schirle M, Schumm M, Pero RS, Doyle A, Checkel J, Kita H, Thiyagarajan N, Acharya KR, Schmid-Grendelmeier PS, Simon HU, Schwart H, Tsutsui M, Shimokawa H, Bellon G, Lee J, Przybyski M, Doring G. Post-translational tyrosine nitration of eosinophil granule toxins mediated by eosinophil peroxidase. J Biol Chem. 283:28629-28640,2008. Uwatoku T, Ito K, Abe K, Oi K, Hizume T, Sunagawa K, Shimokawa H. Extracorporeal cardiac shock wave therapy improves left ventricular remodeling after acute myocardial infarction in pigs. Coron Artery Dis. 18:397-404,2007. Yada T, Shimokawa H, Hiramatsu O, Shinozaki Y, Mori H, Goto M, Ogasawara Y, Kajiya F. Important role of endogenous hydrogen peroxide in pacing-induced metabolic coronary vasodilation in dogs in vivo. J Am Coll Cardiol. 50:1272-1278,2007. Yada T, Shimokawa H, Morikawa K, Takaki A, Shinozaki Y, Mori H, Goto M,Ogasawara Y, Kajiya F. Role of Cu,Zn-SOD in the synthesis of endogenous hydrogen peroxide during reactive hyperemia in mouse mesentetric microcirculation in vivo. Am J Physiol. 294:441-448,2007. Yasuda S, Ikuta K, Uwatoku T, Oi K, Abe K, Hyodo F, Yoshimitsu K, Sugimura K, Utsumi H, Katayama Y, Shimokawa H. In vivo magnetic resonance imaging of atherosclerotic lesions with a newly developed Evans blue-DTPA-gadolinium contrast medium in apolipoprotein-E-deficient mice. J Vasc Res. 45:123-128,2007. Nishida T, Shimokawa H, Oi K, Tatewaki H, Uwatoku T, Abe K, Matsumoto Y, Kajihara N, Eto M, Matsuda T, Yasui H, Takeshita A, Sunagawa K. Extracorporeal cardiac shock wave therapy markedly ameliorates ischemia-induced myocardial dysfunction in pigs in vivo. Circulation. 110:3055-61,2004.